A wacky, fun movie about a misfit who is surrounded by unusual characters, none quite as strange as himself. Napolean Dynamite is a movie about a very strange highschool student who has bizarre ways of looking at the world, yet more often than not seems to be right about how ridiculous things are. He calls people idiots under his breath, and gets angry easily when things don’t go his way. and the funny thing is that this is almost always the case. the movie follows him at a time when his grandma goes away, his uncle comes to live with him, his brother has a love interest come to town, and a new kid in school who barely speaks english becomes his best friend. it’s a lot for one movie, and this film juggles all of these plot points perfectly, giving equal attention to each. 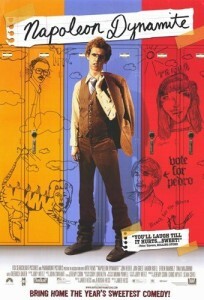 at the start of the movie, napolean (played brilliantly by john heder), gets on a school bus, walks all the way to the back, takes an action figure tied to a string out of his pocket, throws it out the window and then holds onto the string as the figure drags on the ground behind the bus. what is this all about? Simple, it shows how strange this guy is. when a boy asks him what he’s gonna do today, he responds, “whatever i feel like doing, god.” this is an example of how easily he gets upset. the beauty of Napolean Dynamite is that as crazy as he is, he is almost always a character that we can sympathize with and follow. he might be strange as hell, but he’s still the straight man in this movie, because all of the other characters around him are also bizarre and do things to him that actually make him seem like the normal one, a victim to everyone else he comes in contact with. early on in the movie, napolean is presented to us through punchline moments of how strange he is, like when he performs a very feminine song using hand gestures with a group of girls, in front of the class. no other boy would be caught dead doing this sort of thing, and napolean doesn’t even seem to realize how ridiculous he looks. or maybe he just doesn’t care. uncle rico enlists the help of napolean’s brother, chip, in selling things door to door. chip is a funny character unto himself, very feminine and not confident at all. yet around napolean, he feels like a star. so for example, there is a scene where he and napolean fight each other, and what it really comes down to is them trying to catch the other one of guard with a slap to the face. similarly, chip goes to a karate class and the instructor calls him up to the front and uses him to demonstrate, whacking him around in front of the other students. nothing too extreme, but just slapping him in the face every one in a while. it’s quite ridiculous and funny. when the new boy, pedro, arrives in a school, speaking almost no english, napolean suddenly starts to find meaning in his life. with his grandma at home, he was content to live a life of unhappiness, with an annoying brother and no real friends. but now suddenly with uncle rico (who napolean views as an enemy), living under the same roof, napolean suddenly realizes he has to do things for himself. and so he starts by befriending pedro and soon after finds himself copying the traits in his friend that he admires. pedro goes right up to the house of a girl he thinks his pretty and leaves a cake on her doorstep with a note asking her out. napolean can’t believe it. soon he is doing something similar, drawing a picture of the girl he likes (a girl who is best friends with the girl pedro likes and both fit into a jappy click of snotty popular kids). the picture looks nothing like the girl and ends up being unintentionally disturbing, which is all the more funny. and the girl’s mom makes her accept napolean’s invitation to the dance (thanks to uncle rico, although napolean doesn’t know it). this leads to the prom scene, where napolean actually hits it off with another girl instead. someone who is more of an outcast, like him. napolean dynmite is filled with crazy and ridiculous situations. uncle rico orders a time machine online and then is shocked when it doesn’t work. 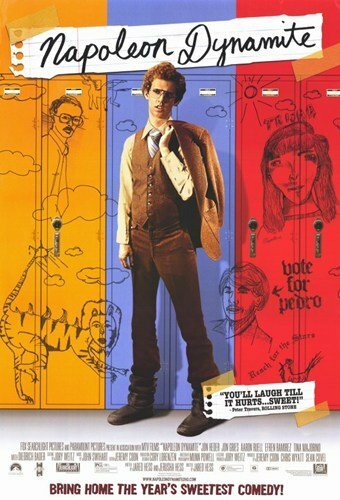 pedro, a boy who is not only new to the school, but also barely speaks the language, decides to run for president. this stuff is way out there. napolean needs some extra money so volunteers at a chicken coop where the chicken’s practically attack him. his brief interactions with the farmer who runs the coop are very funny. the movie starts with the grandma going and both rico and pedro arriving. soon it becomes about the different events that napolean gets mixed up with. taking a girl out to the school dance and then helping pedro with his presidential campagne. when pedro makes a pinata that resembles the girl he is running against, and then sets it up for other students to beat the hell out of it, he sees nothing wrong with the situation. and when uncle rico grabs a piece of steak off chip’s plate and throws it across the yard like a football, slamming right into napolean’s face, he also doesn’t see a problem with what he’s doing. it’s napolean that does. the guy who takes pedro’s bike out for a quick jump on a ramp and ends up breaking the ramp and falling onto the bike. he’s a modern day charlie chaplin and the movie has a lot of fun with both physical humor and bizarre and witty dialogue. it’s a very entertaining film.